The Chief of Army Staff, Lt. Gen. Tukur Buratai, has said no army can have enough equipment for its operations. Buratai, who spoke on the Metele attacks during the 2018 Chief of Army Staff Annual Conference in Maiduguri on Wednesday, said the army had started to strategise for the end of the Boko Haram insurgency in the North-East. The COAS also revealed plans for the 2019 general elections, saying Operation Safe Conduct would be conducted in the country by the army to ensure free and fair elections. 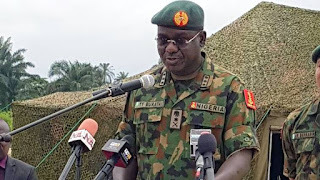 The army chief said, “Internally, there has been violence in some sections of the country, which constitutes security threats to Nigeria’s democracy and existence. The causes of the crises are often for ideological, economic, political, religious and ethnic reasons. Buratai said soldiers must remain non -partisan during the 2019 general elections.